As an upper elementary to middle school teacher I have a variety of learners; enthusiastic and engaged, easily inspired, indifferent, and those that require a bit more encouragement to enhance their joy of learning. Can you relate? While I touch on poetry throughout the school year, I really wanted an age-appropriate resource that would enhance student understanding and enthusiasm for poetry, and so I created this resource. Poetry can feel overwhelming to teach and even more frustrating for students. Use this resource how you see most fit for your crew, but here are some tips and tricks for how I have found it most useful. Share the poetic devices, how to analyze poems, and make it as engaging as possible helping students develop their poetry notebooks. You can use the poetry lesson plans, go page by page from beginning to end, or hop around. 4. 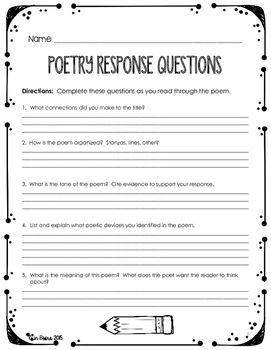 Have students analyze the poems using the “How to Analyze a Poem” Notes and “Questions I Can Answer” Notes. 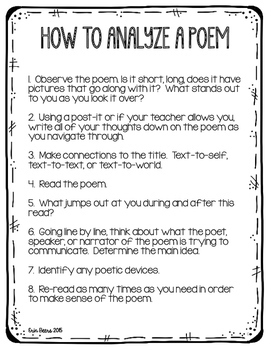 Students should write directly on the poems to become more thoughtful analyzers of poetry. 5. Navigate each of the poems with students to enhance understanding of poetry or allow students work independently, with partners, small groups to read and analyze each of the poems and then go over their analysis together in order to gauge their progress with understanding poetry. 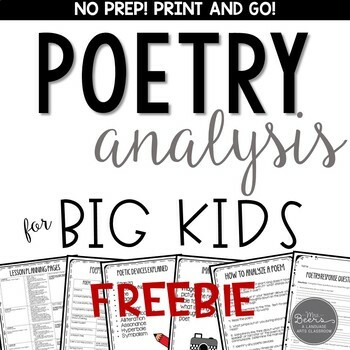 This is the perfect resource to EXCITE your students about poetry analysis! I would love your feedback on this resource. 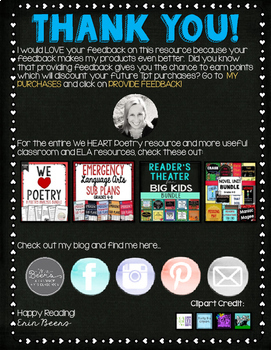 Leaving feedback helps you earn points that will discount future Tpt purchases. Also, be sure to FOLLOW me so you are aware of each new product as soon as it is posted.